مقاله حاضر، باهدف مشخص کردن معیارهای اقلیمی و شناخت رتبه عوامل مؤثر بر کشت زعفران و ارزیابی تأثیر آن در شهرستان رشتخوار از توابع استان خراسان رضوی انجام گردیده است. فرضیه اصلی تحقیق این است که شهرستان رشتخوار شرایط لازم، جهت کاشت و افزایش زیر کشت بردن، محصول زعفران را دارد و در طول تحقیق همواره این سؤال مدنظر بوده که کدام‌یک از عوامل اقلیمی تأثیر بیشتری بر کشت زعفران در شهرستان رشتخوار داشته است. روش تحقیق توصیفی-تحلیلی بر پایه گردآوری داده‌های ایستگاه‌های هواشناسی منطقه و عملکرد زعفران در منطقه موردمطالعه، دریک دوره‌ی ده‌ساله است. در این تحقیق با در نظر گرفتن عوامل اقلیمی مؤثر بر کشت زراعی زعفران از روش تحلیل سلسله مراتبی (AHP) و برای اولویت‌بندی نواحی روستایی دهستان‌های منطقه رشتخوار به منظور کشت اراضی استفاده‌شده است. فرایند تحقیق شامل گردآوری اطلاعات، محاسبات و تحلیل‌های آماری، ورود اطلاعات به نرم‌افزار Expert choice، خوشه‌بندی و ارزش‌گذاری معیارها و تلفیق اطلاعات بوده است. نتایج تحقیق نشان داد، در میان عوامل محیطی، بارش با ضریب (281/0) و دما با ضریب (137/0) بیشترین تأثیر را در کشت زعفران داشته‌اند. منابع آبی و تبخیر در این نظرسنجی نیز پایین‌ترین امتیاز را به خود اختصاص داده‌اند؛ و در میان دهستان‌های این شهرستان، دهستان حسین‌آباد شرایط مناسب‌تری جهت کشت زعفران دارد. 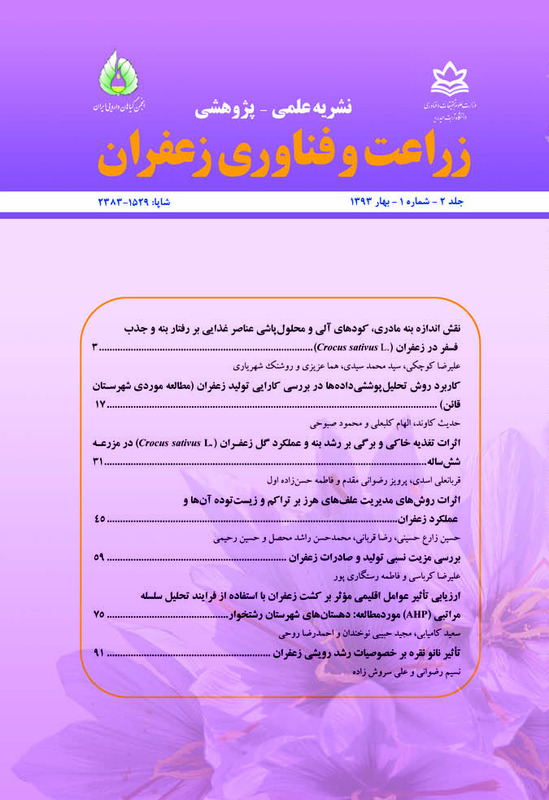 The present paper aimed to determine the criteria for understanding climate and ranking factors influencing saffron and assess its impact on Roshtkhoar city of Khorasan Razavi province. The city of Roshtkhar has potential for increasing saffron cultivation; therefore, the main hypothesis during the research was, which climatic factors had the most influence on the cultivation of saffron in the city Roshtkhar. The research methodology was based on a period of ten years cross-sectional data collected from meteorological stations in the studied area. In this study, with taking into account of climatic factors affecting the cultivation of saffron, Analytical Hierarchy Process (AHP) method was used to prioritize rural and regional municipalities Roshtkhar cultivated land. Research process included data collection, analysis, statistical analysis, data entry software Expert choice, clustering and selection criteria, and integrating information. The results showed that, among environmental factors, precipitation index (0.281) and temperature coefficient (0.137) had the greatest impact in saffron cultivation. Water resources and evaporation of water had the lowest score in the survey accounted. In the municipalities of the city, Hossein-Abad districts had favorable conditions for growing saffron. Alvei, Z., Monazam Ismail, A.M., Hosseinzadeh, A., and Kermani, M. 2013. Feasibility of saffron cultivation in lowland areas prone Kashmar using GIS, Saffron Agronomy and Technology 1 (1): 71-95. (In Persian with English summary). Amani, M. 2008. Cropping pattern replacement strategy to counter the city's Drought Torbate. Second National Conference of drought impacts and management strategies, Tehran... (In Persian with English summary). AsgharPoor, MJ. 2006. Multi Criteria Decision Making. Tehran University Press, (In Persian). Brown, W. M. 1993. AHP, Multiple criteria evaluation, In Klosterman, R. et al (Eds), Spreadsheet Models for Urban and Regional Analysis New Brunswick: Center for Urban Policy Research. Faraj Zadeh, M., and Mirzabyati, R. 2007. Survey sites in lowland zones saffron Neyshabur using GIS, Humanities Teacher Journal 50: 67. Hemmatzadeh, A., and Daneshvar, M. 2010. Effects of spacing and planting depth on the physiological parameters of saffron. Seventh Congress of Iranian Horticultural Science. (In Persian with English summary). J. Bigelow, M., and Mobarki, Z. 2008. Assessment of land suitability for cultivation of saffron in Qazvin province on the basis of multiple criteria decision-making methods, Research in Geography 66: 101-119. (In Persian with English summary). Memariani, A., and Azar., A. 1995. The new method of group decision-making technique AHP. Knowledge Management 27-28: 22-32. Momeni, M., and Sharif Salim, A. 2010. Models and multi-criteria decision making applications. Tehran. p. 140. (In Persian with English summary). Piri, M., and MosesKhani, A. 2006. The level of prices of agricultural products is influenced by macroeconomic instability? (Modeling variability using model GARCH).Sixth onference of Agricultural Economics, Tehran... (In Persian with English summary). Tymori., M. 2007. The Village, ranked by inhibiting factors in land consolidation projects in south Khorasan province. Research Institute of Agricultural Economics and Development 40 (2):145. (In Persian with English summary). Yarmi, N. 2007. Determining potential evapotranspiration and crop coefficients using lysimeters saffron water balance. Ninth Congress Water and Reduce evaporation. (In Persian with English summary).